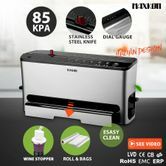 Lengthen your foods lifespan by sealing in the freshness with the Maxkon Vacuum Food Sealer. You will be able to enjoy your food for longer by sealing it in airtight containers. The machine comes with different settings to accommodate dry or moist food. Comes with a with a wide drip tray that is dishwasher safe to avoid messes. The package comes with a bonus wine sealer to help preserve the wine. Making your meals luxurious every time. 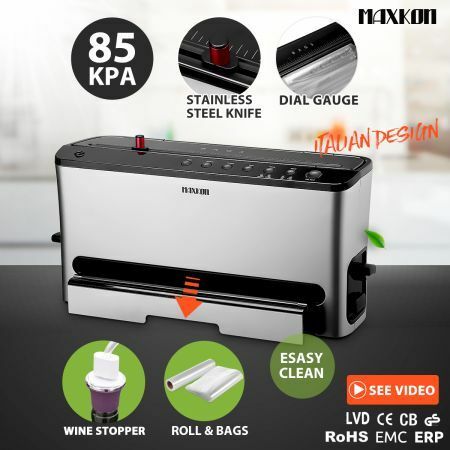 The Maxkon Vacuum Food Sealer will preserve your food air tight! Adjusts vacuum speed based on food type. Adjusts seal level based on dry or moist food. The built-in roll holder stores a Maxkon Roll for added convenience. The dishwasher-safe, extra wide drip tray helps to catch the overflow of liquids. The extra wide sealing strip applies heat for a secure, air-tight seal that locks in the freshness and flavor of food. Includes hose that allows you to seal in freshness with all FoodSaver Containers and Canisters.